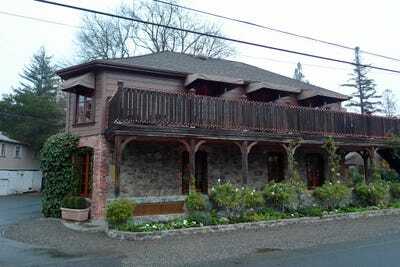 The French Laundry — Chef Thomas Keller’s iconic Napa Valley restaurant — is no stranger to accolades. 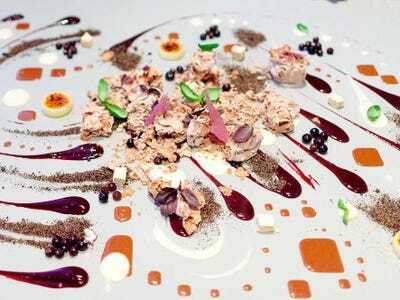 It has topped Restaurant magazine’s annual list of the world’s best restaurants, and Anthony Bourdain has called it “the best restaurant in the world, period.”Now The Daily Meal has named it the best restaurant in America for 2013. 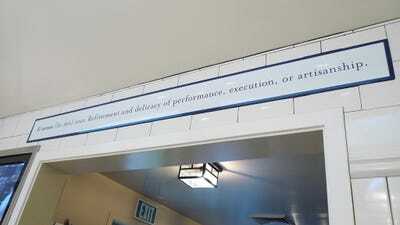 What makes the restaurant so great? 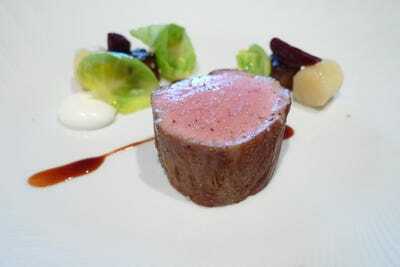 It’s a combination of a stunning location, stellar service, and outstanding food. 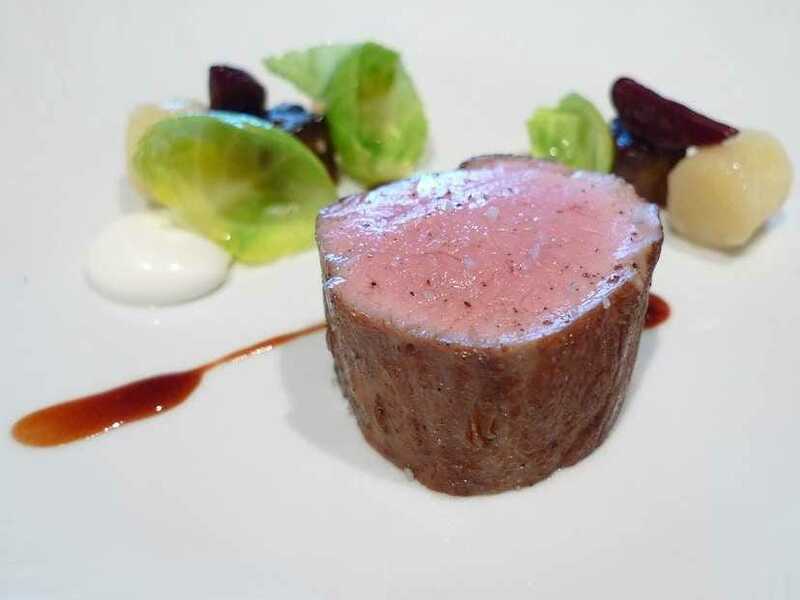 The chefs create two unique nine-course tasting menus every day, and make sure no ingredients are repeated throughout the meal. 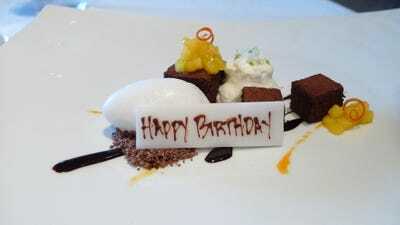 Arnold Inuyaki, who writes the blog Inuyaki — ‘Surprisingly Good,’ ate at The French Laundry and met chef Thomas Keller in December 2009. 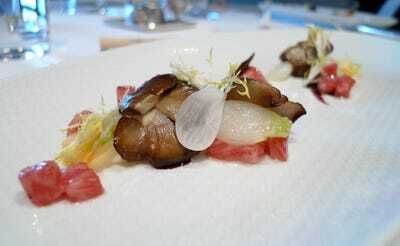 He shared pictures from the incredible five-hour+ meal with Business Insider. Back then, the price-fixe menu cost $240 per person; today it’s $270. Add in wine, and the cost jumps significantly. But if you are going to splurge on a once-in-a-lifetime meal, this should be it. 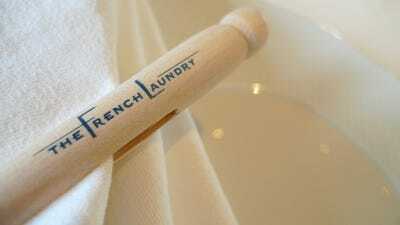 The French Laundry is located in Yountville, California, in the Napa Valley wine country. 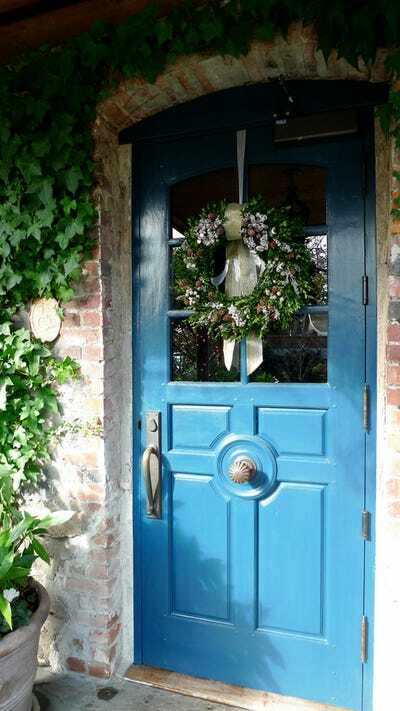 It's surrounded by gardens and greenery, and you enter through this pretty blue door. 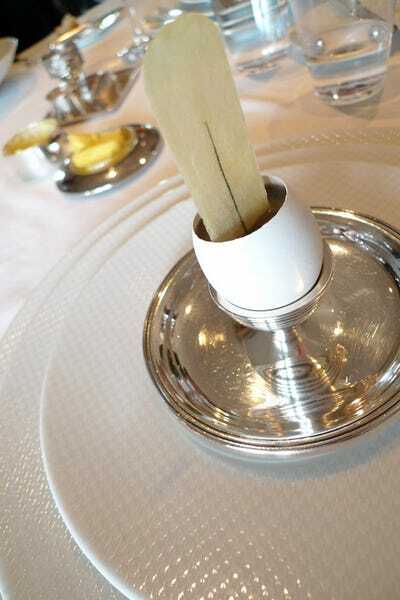 Special clothespins hold the napkins together. Great marketing! Now let's get down to the meal. 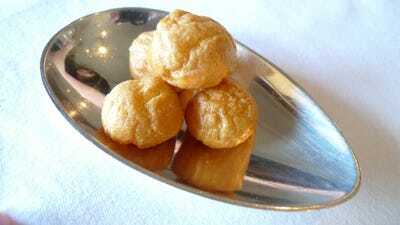 Here was the first course of gougères, a savory French pastry with a cheese-y inside. 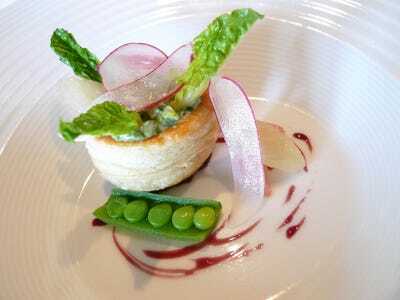 Salmon cornets (plus one vegetarian version) were presented in elegant napkins. 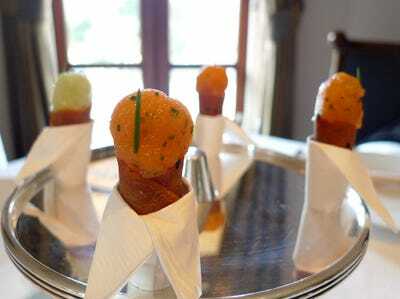 It's a delicious mix of red onion crème fraîche and salmon tartare in a buttery cone. 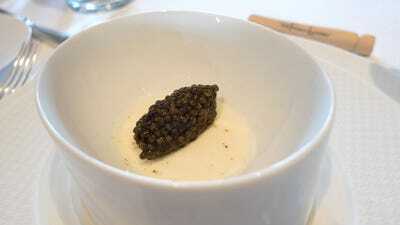 The cauliflower panna cotta was next, topped with beluga caviar. 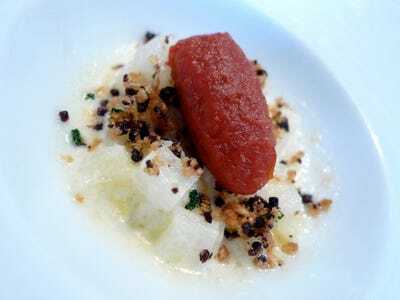 The following cardoon gratin dish was made from cardoons (similar to artichoke), with nicoise olives and a San Marzano tomato compote. 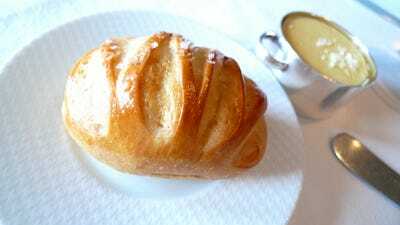 Then it was time for the delicious pain au lait from the Bouchon Bakery down the street. 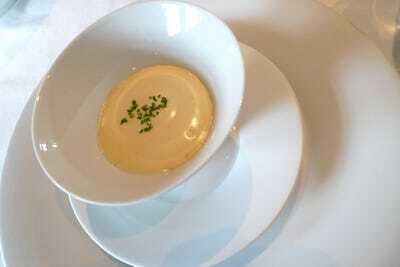 It's served with an unsalted goat's milk butter and a whipped salted cow's milk butter. 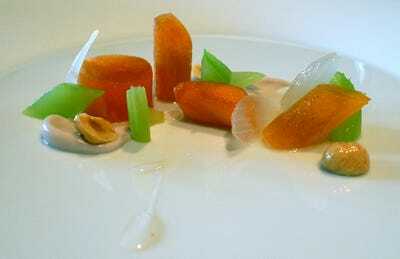 The Fuyu Persimmon salad was an assortment of sliced and arranged vegetables with dollops of sauce for dipping. 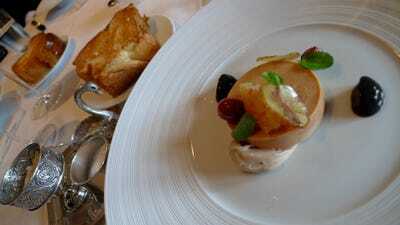 The moulard duck foie gras au torchon takes four days to prepare, and was absolute perfection, said Inuyaki. 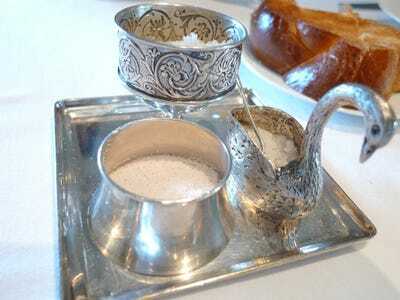 It was accompanied by a series of well-presented salt selections. Next was the grilled pavé of Japanese Toro. 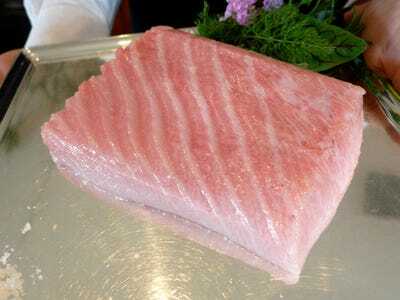 Before it was cooked, the waiter showed the group the tuna they would be eating. And here's the finished dish with satsuma mandarins, eggplant, fennel, and pimenton (a type of paprika). 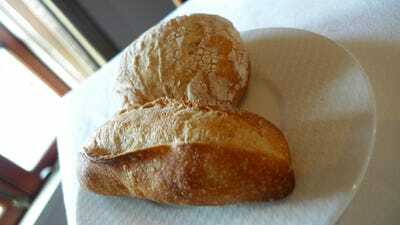 A bread course of ciabatta and baguette was also laid on the table for diners to enjoy. 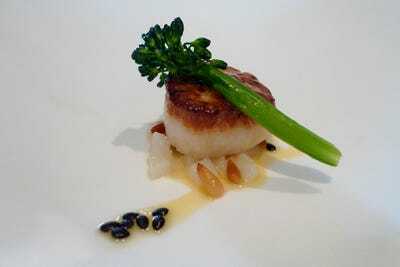 The Georges Bank sea scallop poêlée was perfectly seared. Next, the roasted potato royale was an other-worldly combination of marbled potatoes, lobster Bearnaise, and scallions. 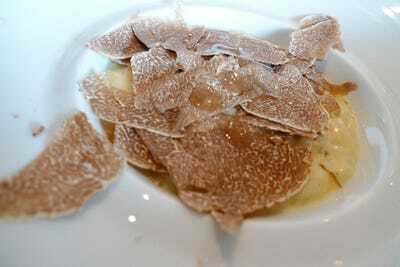 The white truffle custard was next served in an egg shell with black truffle ragout and a chive potato chip. Another outstanding course from the truffle tasting menu was the Risotto with white truffles from Alba with brown butter. Tokyo turnips, picked garlic, and a red wine reduction accompanied the Korege Beef tartare. 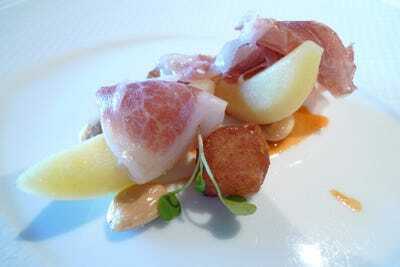 This ham dish had marcona almonds, arugula, and flowering quince. 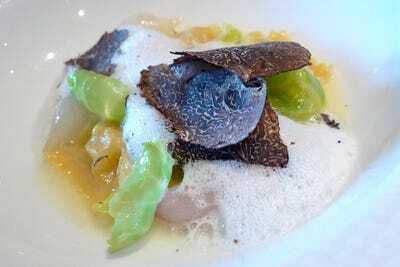 The hand-rolled parsnip agnolotti had pearl onions and was topped by huge black truffle shavings. 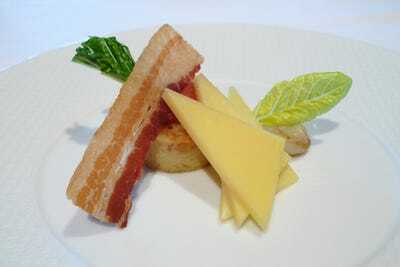 One cheese course was served with Hobb's bacon, comté cheese, caramelized onion pain perdu, and romaine lettuce. 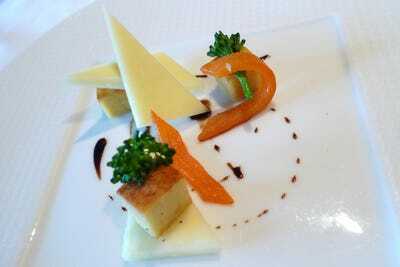 The other combined the Vermont Shepherd cheese with sweet peppers, 100-year aged balsamic vinegar, and panisse. 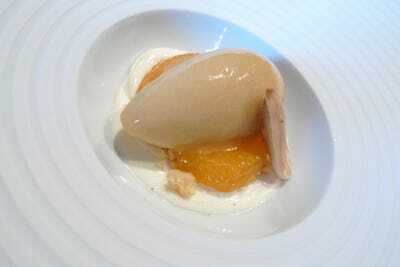 The Feijoa sorbet was presented with Tahitian vanilla panna cotta, satsuma Mandarin oranges, and toasted pili nuts. 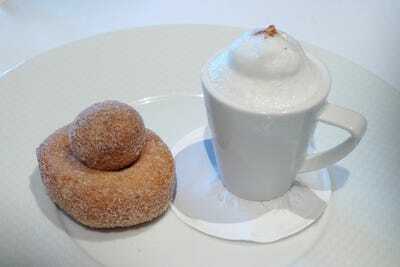 Thomas Keller's signature cinnamon-sugared doughnuts were served alongside a cappuccino semi-freddo. The course looked picture-perfect. 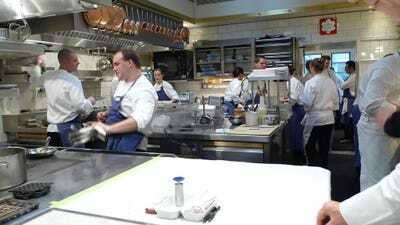 The diners entered the expertly-run kitchen where all the chefs were making sure each dish was ready to go. 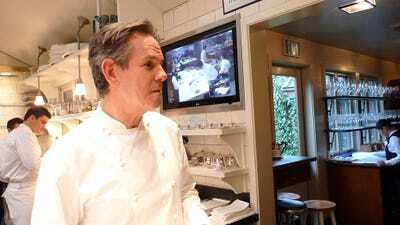 They even got to meet chef Thomas Keller, and see the live video feed from the Per Se kitchen in NY (another of Keller's restaurants). A few tips from the famous chef before it was time for dessert. 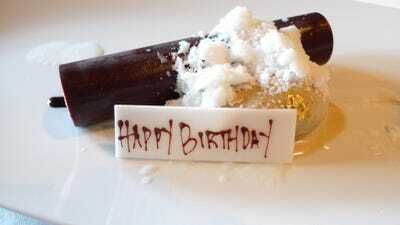 The group celebrated two birthdays with an opera cake with coffee ice cream. 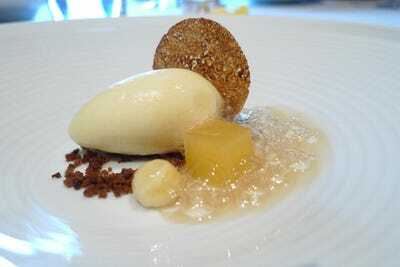 As well as Gateau Saint Nizler with mango chilli relish, Valrhona cocoa nibs, and coconut milk sorbet. 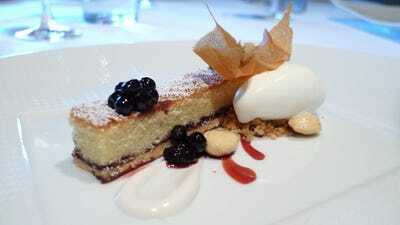 There was also a bakewell tart with huckleberries and créme fraîche sorbet. 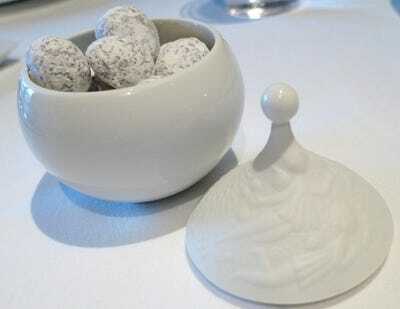 Then it was time for the mignardises. 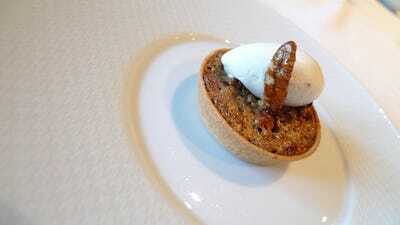 They included a pecan pie with Créme Chantilly. Toasted macadamia nuts rolled in chocolate and caramel, then dusted with confectioner's sugar. 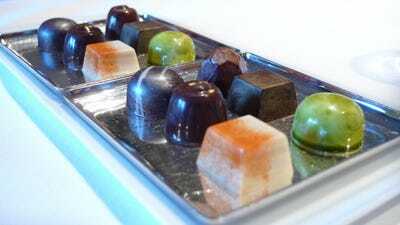 And a selection of chocolate truffles. 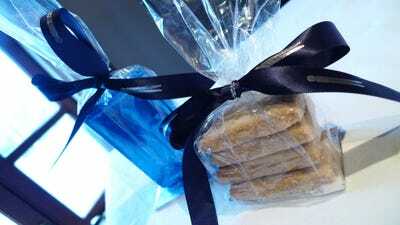 They were even presented with signed menus by Keller, as well as shortbread cookies and French Laundry chocolate bars. And, of course, the staggering bill. That's $445 per person, including wine.